19/3/16: Please be assured, tickets are still available in the nave as well as the unreserved side aisles. They will be on sale in the cathedral in the afternoon today and on the door from 6:30pm. Our major work of the season. The haunting call of a ram’s horn; dawn is breaking. The Angel Gabriel has spoken. The Apostles gather as Hebrew melodies swirl in the early morning air. And yet, a traitor waits in the mist. 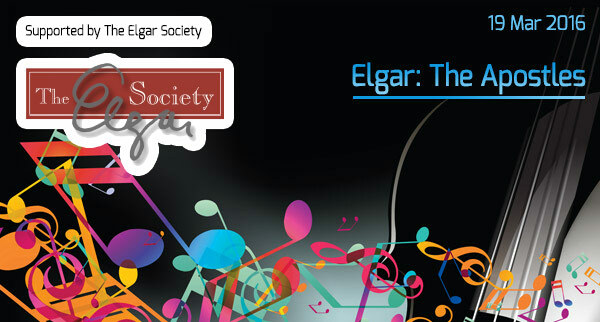 Less often performed than Dream of Gerontius and The Kingdom, The Apostles is Elgar at the height of his powers. Expect to be surprised as myriad glorious moments unfold, from the hair raising drama of Judas’s descent into oblivion to the despair of Christ’s Passion and the shining climax of The Ascension. The final Alleluias should follow you home. Note: This concert is dedicated to the memory of George Hayter, one of our basses, who died in April 2015.